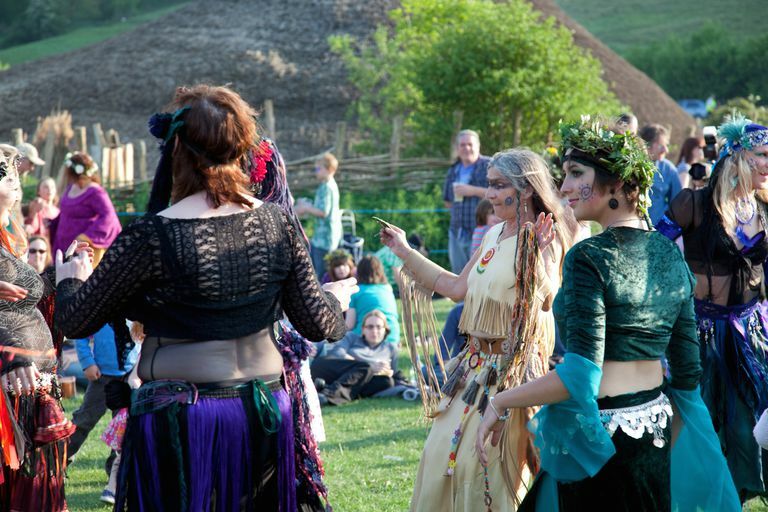 Beltane kicks off the merry month of May, and has a long history. This fire festival is celebrated on May 1 in the northern hemisphere (and at the end of October below the equator) with bonfires, Maypoles, dancing, and lots of good old fashioned sexual energy. The Celts honored the fertility of the gods with gifts and offerings, sometimes including animal or human sacrifice. Cattle were driven through the smoke of the balefires, and blessed with health and fertility for the coming year. In Ireland, the fires of Tara were the first ones lit every year at Beltane, and all other fires were lit with a flame from Tara. Beltane, which falls on May 1 in the northern hemisphere, is a season associated with the fertility of the land, planting, and fire. In some Pagan belief systems, Beltane is a time in which the boundary between our world and the faerie realm is thin. There are many pre-Christian figures connected to this sabbat celebration, including the Green Man and the god Cernunnos. The Romans, always known for celebrating holidays in a big way, spent the first day of May paying tribute to their Lares, the gods of their household. They also celebrated the Floralia, or festival of flowers, which consisted of three days of unbridled sexual activity. Participants wore flowers in their hair (much like May Day celebrants later on), and there were plays, songs, and dances. At the end of the festivities, animals were set loose inside the Circus Maximus, and beans were scattered around to ensure fertility. The fire festival of Bona Dea was also celebrated on May 2nd. This celebration, held at Bona Dea's temple on the Aventine Hill, was a festival of women, mostly plebian, who served as priestesses and sacrificed a sow in the fertility goddess' honor. May 6 is the day of Eyvind Kelda, or Eyvind Kelve, in Norse celebrations. Eyvind Kelda was a Norwegian martyr who was tortured and drowned on the orders of King Olaf Tryggvason for refusing to give up his Pagan beliefs. According to the tales of the Heimskringla: The Chronicle of the Kings of Norway, one of the best known Norse sagas compiled by Snorri Sturluson around 1230 c.e., Olaf announced that once he had converted to Christianity, everyone else in his country needed to be baptized as well. Eyvind, who was believed to be a powerful sorcerer, managed to escape Olaf's troops and make his way to an island, along with other men who continued to believe in the old gods. Unfortunately, Olaf and his army happened to arrive there at the same time. Although Eyvind tried to protect his men with magic, once the mists and fog cleared, they were exposed and captured by Olaf’s soldiers. A week later, Norwegians celebrate the Festival of the Midnight Sun, which pays tribute to the Norse sun goddess. This festival marks the beginning of ten straight weeks without darkness. Today, this celebration of music, art, and nature is a popular spring celebration in Norway. Also in May, the Greeks celebrated the Plynteria in honor of Athena, the goddess of wisdom and battle, and the patroness of the city of Athens (which was named after her). The Plynteria includes the ritual cleansing of Athena’s statue, along with feasting and prayers in the Parthenon. Although this was a fairly minor festival, it was significant to the people of Athens. On the 24th, homage is paid to the Greek moon-goddess Artemis (goddess of the hunt and of wild animals). Artemis is a lunar goddess, equivalent to the Roman moon-goddess Diana–she is also identified with Luna, and Hecate. A related character is Jack-in-the-Green, a spirit of the greenwood. References to Jack appear in British literature back as far as the late sixteenth century. Sir James Frazer associates the figure with mummers and the celebration of the life force of trees. Jack-in-the-Green was seen even in the Victorian era, when he was associated with soot-faced chimney sweeps. At this time, Jack was framed in a structure of wicker and covered with leaves, and surrounded by Morris dancers. Some scholars suggest that Jack may have been a ancestor to the legend of Robin Hood. Today's Pagans celebrate Beltane much like their ancestors did. A Beltane ritual usually involves lots of fertility symbols, including the obviously-phallic Maypole dance. The Maypole is a tall pole decorated with flowers and hanging ribbons, which are woven into intricate pattern by a group of dancers. Weaving in and out, the ribbons are eventually knotted together by the time the dancers reach the end. In some Wiccan traditions, Beltane is a day in which the May Queen and the Queen of Winter battle one another for supremacy. In this rite, borrowed from practices on the Isle of Man, each queen has a band of supporters. On the morning of May 1, the two companies battle it out, ultimately trying to win victory for their queen. If the May Queen is captured by her enemies, she must be ransomed before her followers can get her back. There are some who believe Beltane is a time for the faeries–the appearance of flowers around this time of year heralds the beginning of summer and shows us that the fae are hard at work. In early folklore, to enter the realm of faeries is a dangerous step–and yet the more helpful deeds of the fae should always be acknowledged and appreciated. If you believe in faeries, Beltane is a good time to leave out food and other treats for them in your garden or yard. For many contemporary Pagans, Beltane is a time for planting and sowing of seeds–again, the fertility theme appears. The buds and flowers of early May bring to mind the endless cycle of birth, growth, death and rebirth that we see in the earth. Certain trees are associated with May Day, such as the Ash, Oak and Hawthorn. In Norse legend, the god Odin hung from an Ash tree for nine days, and it later became known as the World Tree, Yggdrasil. If you've been wanting to bring abundance and fertility of any sort into your life -- whether you're looking to conceive a child, enjoy fruitfulness in your career or creative endeavors, or just see your garden bloom -- Beltane is the perfect time for magical workings related to any type of prosperity.